In part 1 we talked about Caching introduction and some terminologies of caching and in part 2 and part 3 we have seen some implementation of the famous replacement cache algorithms and in part 4 we saw comparisons between some famous caching frameworks and in this part we are going to continue what we started in part 4 and as in part 4 we will concentrate only on memory caching. After programmer 1 released the caching article in “Programming Mania” the geek to geek magazine, he got a lot of threaten mails and terrible messages from caching geeks defending their beloved caching frameworks and warning him if he didn’t make their beloved caching framework win the contest, he will regret the day he became a programmer. ShiftOne or as they call JOCache is a lightweight caching framework that implements several strict object caching policies which comes up with a set of cache algorithm implementations that supports in memory cache. Element Timeout - each cache has a maximum time that it's elements are considered valid. No element will ever be returned that exceeds this time limit. This ensures a predictable data freshness. ShiftOne use decorator pattern in order to make it more flexible for the user to use any underneath caching product to maintain the cache. ShiftOne enables client to gather statistics (Hit/Miss) about the cache by using JMX, not only that but also enables integration with Hibernate ORM through adaptors. When it comes to in memory caching (which is the only thing JOcache supports) JOCache uses Soft references for the caching entries. 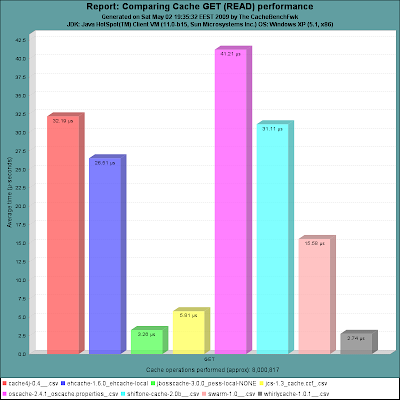 JOCache was originally implemented as part of the ExQ project to support ResultSet caching. It was later split out for use by other projects. It was designed to cache large expensive database query results. WhirlyCache is a fast, configurable in-memory object cache for Java. It can be used to speed up a website or an application by caching objects that would otherwise have to be created by querying a database or by another expensive procedure it also provides an in-memory cache. WhirlyCache runs a separate thread to prune the cache; in other words, the data from the cache is not provided by the same application thread that the client uses. Thus, there are fewer burdens on the application thread. Many attributes of Whirlycache are configurable in an XML file, but the most important components of the cache are the Backend, the Tuner, and the Policy. WhirlyCache support pluggable backend implementations that need to implement the ManagedCache interface (which is a subinterface of java.util.Map, although not all the methods of Map need to be implemented). WhirlyCache currently support two backends: ConcurrentHashMap and FastHashMap. You can even implement your own backed by implementing the ManagedCache interface. The Tuner is a background thread that performs cache maintenance activities specified in the configured Policy implementation. One Tuner thread per cache is created and it is configured to run every n seconds. It depends on your application, but you definitely don't want to run the Tuner too often since it will only serve to burden the system unnecessarily. SwarmCache is an in-memory cache intended more for caching domain objects on the data access layer. It offers support for a distributed cache in a clustered environment. 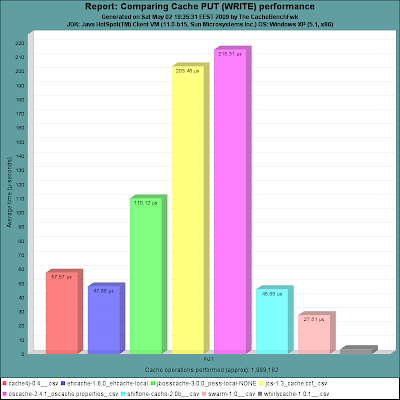 SwarmCache supports the LRU caching algorithm. However, SwarmCache is essentially an in-memory cache. When LRU is set as the caching algorithm and the memory capacity is reached, SwarmCache evicts the memory objects as per LRU logic from its memory. SwarmCache uses soft references to the cached objects. So, if the LRU is not set as the caching algorithm, it relies on the garbage collector to swipe through its memory and clean objects that are least frequently accessed. However, SwarmCache recommends a combination of the above two to be set as the caching algorithm. When used in clustering environment each server instantiates its own manager. For each type of object that the server wishes to cache, it instantiates a cache and adds it to the manager. The manager joins a multicast group and communicates with other managers in the group. Whenever an object is removed from a cache, the manager notifies all other managers in the group. Those managers then ensure that the object is removed from their respective caches. The result is that a server will not have in its cache a stale version of an object that has been updated or deleted on another server. JBoss offers two kinds of cache flavors, namely CoreCache and PojoCache. JBoss Core Cache is a tree-structured, clustered, transactional cache. It can be used in a standalone, non-clustered environment, to cache frequently accessed data in memory thereby removing data retrieval or calculation bottlenecks while providing "enterprise" features such as JTA compatibility, eviction and persistence. JBoss Cache is also a clustered cache, and can be used in a cluster to replicate state providing a high degree of failover. A variety of replication modes are supported, including invalidation and buddy replication, and network communications can either be synchronous or asynchronous. POJO Cache is an extension of the core JBoss Cache API. POJO Cache offers additional functionality such as: maintaining object references even after replication or persistence. fine grained replication, where only modified object fields are replicated. "API-less" clustering model where POJOs are simply annotated as being clustered. being able to participate in JTA transactions (works with most Java EE compliant transaction managers). Attach to JMX consoles and provide runtime statistics on the state of the cache. Allow client code to attach listeners and receive notifications on cache events. The cache is organized as a tree, with a single root. Each node in the tree essentially contains a map, which acts as a store for key/value pairs. The only requirement placed on objects that are cached is that they implement java.io.Serializable. JBoss Cache works out of the box with most popular transaction managers, and even provides an API where custom transaction manager lookups can be written. The cache is completely thread-safe. It employs multi-versioned concurrency control (MVCC) to ensure thread safety between readers and writers, while maintaining a high degree of concurrency. The specific MVCC implementation used in JBoss Cache allows for reader threads to be completely free of locks and synchronized blocks, ensuring a very high degree of performance for read-heavy applications. It also uses custom, highly performant lock implementations that employ modern compare-and-swap techniques for writer threads, which are tuned to multi-core CPU architectures. Multi-versioned concurrency control (MVCC) is the default locking scheme since JBoss Cache 3.x. In the 1st and 3rd cache test case it just simple testing of retrieve and populating the cache, while in JBoss cache benchmark there are a lot of test cases shipped with the benchmark from replication to distributed and clustering testing. All the testing here were performed on a single machine (no distributed testing were performed) and all the testing were performed in memory. We can see here that there is nearly 8 million get operation invoked on the different cache frameworks and the WhirlyCache took the smallest amount of time (followed by JBoss Cache) while OSCache took the biggest time. The cache test performed here was in memory cache and there were 25 threads accessing the cache. As we can see the SwarmCache took the biggest time while ehcache and whirlyCache took the smallest time. And the gold medal goes to! Our candidate frameworks in this part are WhirlyCache and JBoss cache both of them are achieved very good performance in the cache hit and miss but let's not forget that Whirly is not distributed cache which is a bad thing , beside that JBoss offers structure cache as we discussed before beside the transaction mechanism that is offered by it also , WhirlyCache is really nice for in memory cache either in single or multi threaded application on the contrary Swarm cache performance is really bad in multi threading application , it throw out of memory exception more than once while it is being tested . Second place goes to ShiftOne which is really nice but suffer from lake of support ,documentation and even configuration. In this part we have seen the comparison of different Open source cache frameworks we and concluded that EhCache is considered one of the bets choices (beside JBoss and Whirly cache) while Swarm is one of the poorest choice you will ever make. A quick note on your evaluation. I know it's hard to include every aspect of the cache, but in the project I'm working on we desperately needed group functionality. And although EhCache shines on the performance it wasn't a suitable candidate just because of the lack of this feature. The grouping is useful when cache entries are linked to each other somehow and one might want, for example, to flush all linked entries upon change of a single element in the group. Not a big thing though but might benefit people who read these evaluations by saving time while making decisions. ..And last but not least - thanks for great series of articles! Keep up the great work! Well done Ahmed. I am also of the same opinion. I want to present this to management. But along with report, I also want to show real time stats using test execution. Is it possible that you upload your test code and I may re-use it to strengthen my presentation to management? Thanks for your nice comment, as for the source files, just tell me which test case you want? I could be wrong, but when last we evaluated JBoss Cache/JCS and OSCache. In our finding Jboss cache has terrible ‘put’ time with DISK persistence enabled and each node having thousands of entries. One reason supporting that is Jboss cache persist whole LinkedHashMap() rather individual entries.